The internet’s ability to connect people has always been its most important function. Decades before the emergence of social media, early adopters of computer networks treated them as fundamentally another communication technology, but one with the potential to bridge gaps of time and distance in exciting new ways.1 But the connections being forged through these networks rarely remained purely online. Artists in particular saw the internet not only as a tool for finding new and distant audiences, but as a platform for highly social collaboration and discourse that moved fluidly between online discussion groups and offline meet-ups. It was out of this process that the practice of internet art emerged. What falls under the category of “internet art” has always been highly eclectic, encompassing everything from web sites to application packets to networked protests and performances, and its boundaries remain contested. In this essay, I’ll be using the terms “internet art” and “net art” interchangeably to refer to practices that reflexively examine the technological, social, and/or political basis of computer networks. The porousness of this definition points to the fact that attempts to strictly define net art by its formal or material substrates inevitably fall short. Instead, internet art is united by its practitioners’ interest in the network as a site of communication, collaboration, and exchange, values that—as you can see in the data visualizations and this accompanying essay—have motivated artists’ encounters with computer networks from the very beginning. In the 1960s, the U.S. military built ARPANET, a computer network that was only ever available to the military and a small number of university campuses, but is widely acknowledged to be the predecessor to today’s internet.2 Then, in the early 1970s, an ambitious group of friends in Berkeley, California decided to adapt the principles of ARPANET to something that could perform a community service, helping local people connect and share information. They gained access to a mainframe computer and built the first version of Community Memory, which consisted of the central mainframe and several terminals for accessing it that they placed in area neighborhoods.3 The group described the project as a public bulletin board system: a bulletin board because it allowed for posting shared messages, and public because it made computer networks available to people without access to ARPANET for the first time. Although it would be another twenty years before anything resembling today’s internet began to appear, their conviction that computer networks should be a way for all people to connect and share information persisted, particularly among artists. 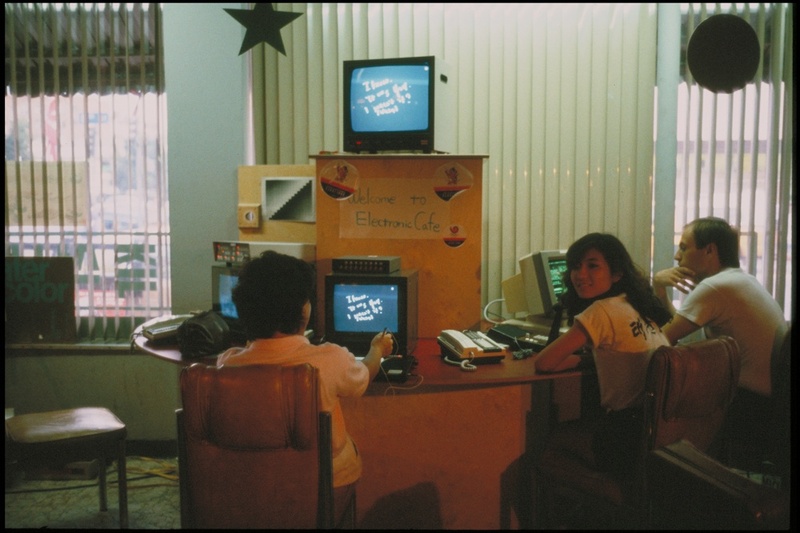 Courtesy of Sherrie Rabinowitz & Kit Galloway Archives, Korean location, Electronic Café multimedia network, Los Angeles Olympic Arts Festival, 1984. The Community Memory database reappeared in one of the first attempts to utilize computer networks in an art context. Working under the name Mobile Image, artists Kit Galloway and Sherrie Rabinowitz used it for Electronic Café, a partially MOCA-sponsored project installed in conjunction with the 1984 Los Angeles Olympics.4 For Electronic Café, Galloway & Rabinowitz set up terminals at restaurants and coffee shops around Los Angeles (as well as one in MOCA itself), teaching visitors how to use networked computers and encouraging activities like chatting between locations, live performance, real-time simultaneous drawing, and contributions to the Community Memory database, to which all the terminals were connected. Working both within and outside of the museum, Electronic Café asserted that the network’s unique ability to connect people was at the core of its value for artistic practice, a principle that would remain consistent through much of the experimentation with art and computer networks through the 1990s. Meanwhile, since the development of the Community Memory project, microcomputers and modems had appeared, making it a little bit easier for individuals to access computer networks. This led to the development of Bulletin Board Systems (BBSes) in the early 1980s, which allowed people to dial into a central computer server over telephone lines and interact with one another. The exact nature of these interactions depended on the type of BBS, but people generally used them to communicate through message boards, chat rooms, and email, including sharing links to downloadable files. This last function piqued the interest of many artists who wanted to use the networks to share their work, although primitive graphics cards and slow network speeds meant that this was far more effective for digital artworks than for high quality reproductions of things like painting and photography. Other, similar technologies were also being developed in the early 1980s, including Mailbox, of Canadian origin, and Minitel, which was created in France.5 Mailbox provided the infrastructure for the first major artist-run computer communications network, which launched as ARTBOX in 1980, became known as the Artists’ Electronic Exchange System (ARTEX) in 1982, and ran continuously until 1991. One of the primary ARTEX managers was Robert Adrian X, a Canadian artist who had immigrated to Austria and who focused on telecommunication systems like radio, fax, BBSes, and, eventually, the World Wide Web. Adrian X’s broader interest in the use of telecommunications for art influenced the perception that ARTEX could provide a platform for both discussion and creative practice, and this platform in turn became a model for the many arts and culture-oriented BBSes that quickly followed. Courtesy of Wolfgang Staehle, THE THING New York, ca. 1992. Although these are all computer networks that aspired to connect people across geographic distances, I’ve included their countries of origin because their physical sites remained quite relevant. In order to connect to a BBS’s central server, users had to dial into regular telephone lines with their modems, which meant that they were paying regular telephone charges. As a result, even if you lived in a place with robust internet infrastructure and could overcome the financial barriers to owning a computer and modem (or at least gain regular access to them), the long distance costs of dialing into a BBS outside of your area were so prohibitive that people using the networks were almost always local. Attempts to use a BBS for international communication required organizers to go to great lengths to get around this problem. 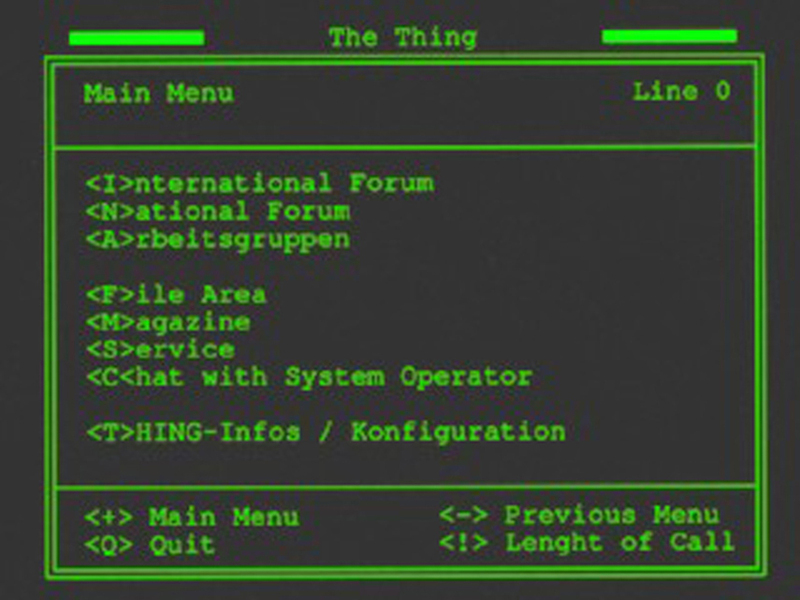 For example, Wolfgang Staehle, who managed the original New York hub of THE THING, would dial into the European hubs after midnight when long distance calls became less expensive and download the day’s conversations in batches to be distributed the next day to the local network. Many of the people managing the European hubs did the same, thereby at least attempting to generate an international online dialogue, albeit asynchronously and a bit awkwardly. Thus in spite of claims for the internet’s globalizing effects on art as on everything else, from the very beginning locational specificity mattered: to participate in the conversations in the 1980s and early 1990s that were shaping the practices that would eventually become recognizable as internet art, you not only had to have local access to internet infrastructure (and the financial and technical resources to use it), you also had to already be in the same region as one of the influential arts-oriented discussion groups, or be prepared to start one up yourself. Then, in the early 1990s, Tim Berners-Lee invented a hypertext system (the “h” in the “http” in your browser’s address bar) that he called the World Wide Web; without getting too deeply into the technical details, what you need to know is that you’re accessing the web with the browser you’re using to read this essay, but the web is not synonymous with the internet. Like email and BBSes, it is a system that uses the computer networks that we know collectively as the internet, but unlike those earlier programs it would, after some trial and error, eventually make internet use intuitive enough to drastically lower one of the barriers to going online. One of the first important breakthroughs in this process was the appearance first of Mosaic and then of Netscape in 1994; together, these relatively easy to navigate web browsers initiated the first wave of web sites and the beginning of the growth of internet use that would inspire, among other things, intensified exploration of the possibilities for producing internet-based art.7 With the arrival of the web, the issue of dialing costs that plagued the BBSes went away—as long as you could afford the flat fee for an internet service provider to connect your modem to the internet, you could now communicate with anyone, anywhere via web-based services like forums or email list managers, which started to replace the BBSes as centers for online discourse and socializing (more on these below). But as you can see on the map, the effects of geography persisted. This was due in part to the infrastructural imbalance between wealthy and poor countries, which was often glossed over in early excitement over the internet’s connective potential—it’s difficult to make internet art if you have neither the computers nor the local networks required to get online.8 But even within wealthier countries you see a regional bias; while there were almost certainly individuals making internet art anywhere that there was internet access, the map reveals how much the social infrastructure that nurtured these practices remained clustered around certain regions. In other words, the dominance of certain areas in Europe and, a bit later, the United States in histories of early internet art isn’t just the result of better internet access in these places, or of the art-historical tendency to center Europe and the U.S. in most narratives. The map shows us that the interpersonal networks that were so critical to the development of internet art and the visibility of its participants were also anchored in these regions. However, it’s important to reiterate that this doesn’t mean that no one was making internet art in other parts of the world. For example, Brian Mackern’s netart_latino_database tracks a large group of internet artists working in Central and South America from the late 1990s into the early 2000s. And two internet art groups from outside the U.S. and North America that remain very influential today also emerged during this period: the Raqs Media Collective, which formed in India in 1992, and Young Hae Chang Heavy Industries, who started working together in South Korea in 1999. The map consists of three layers, each of which represents a locus of interpersonal connection and interaction that was critical to the development of internet art: the aforementioned BBSes; arts-oriented media centers; and what I am calling “meet ups,” or the mix of formal and informal conferences, symposia, and arts festivals at which people interested in culture and computer networks gathered to share artwork and ideas (and, of course, to party). As noted, the BBSes were very localized because of the costs of dialing into a long distance telephone number. But even as the web made the internet easier and a little bit less expensive to use, a certain amount of technological savvy and determination was still required to get online in the mid-1990s. This fostered a culture of peer-education that branched out of people’s living rooms and into media centers and internet cafés where interested individuals could come to learn how to use internet-connected computers; many of them were run by artists, and these attracted other artists who wanted to learn how to incorporate computers and computer networks into their practices.9 Some of these centers were relatively informal, run by individuals and funded however they could manage (whether from public grants or, more often, side businesses making web pages or offering web hosting). For example, after artists Remo Campopiano and Robbin Murphy transformed their Manhattan-based ARTNET BBS into the Artnetweb web site in 1993, they opened the Artnetweb storefront in Manhattan, where the walls were lined with educational pamphlets and individuals were encouraged to walk in and learn how to use the internet and explore artistic collaborations. Courtesy of Amsterdam Museum, Avatars of De Digitale Stad (DDS), ca. 1994 – 1998, CC BY-NC-SA. 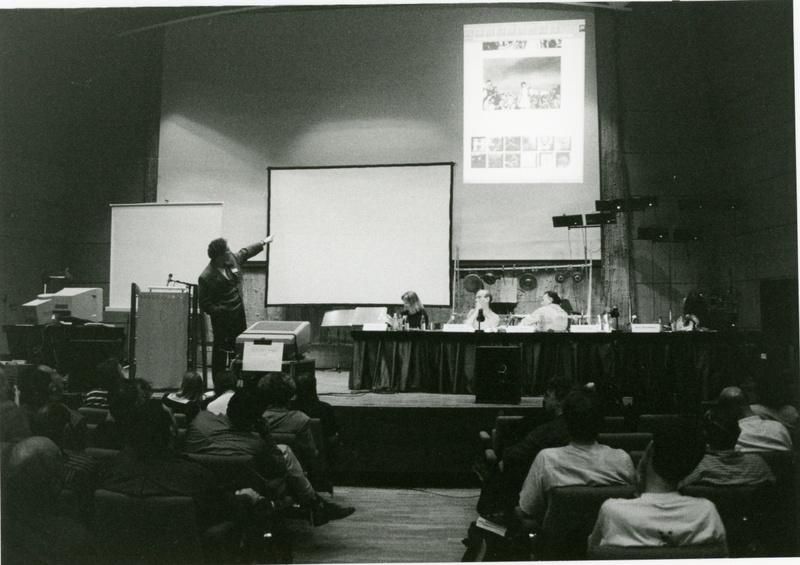 Courtesy of Ars Electronica, Conference at Ars Electronica Festival: Welcome to the Wired World – Mythos Information, 1995. The media centers, however, were not the only important offline gathering places for internet artists. Most of them also participated in a wide range of festivals, symposia, and semi-organized conventions that provided critical venues for strengthening social connections and nurturing the in-person dialogues and collaborations that would be continued online. More detail about the individual events can be found on the timeline and map, but it’s worth noting that they ranged from major organized events like the long-standing arts and technology festival Ars Electronica and the Next 5 Minutes tactical media conferences to small gatherings featuring activities like socializing, conversation, and eating ice cream. The in-person interactions that happened at these meet-ups were essential to the growth of internet art, but they were all germinated or at least promoted first in online discussions that were kept going well after the events were over, creating a feedback loop that underscores the critical entanglement between on- and offline networks: for internet artists, neither one could be truly productive without the other. The 1990s and early 2000s represented the first recognizable phase of internet art, sandwiched between the exponential growth of internet use after the advent of the web and a major shift in both general and arts-specific internet practices that was touched off by the dot com crash and the rise of social media and “web 2.0” platforms.14 Today, the medium-specific boundaries of early net art remain amorphous and difficult to define, but this is because we’re searching in the wrong place. The activities of these years reveal how the practice was forged in the spaces between the BBSes, email lists, media centers, and meet-ups—the relationships they nurtured, the discussions they hosted, and the collaborations they generated all reinforced the principle of connecting people as more fundamental to net art than any of its technological underpinnings. Megan Driscoll is a PhD candidate in art history at UCLA, working in contemporary art and digital humanities. “Online and Off: Interpersonal Networks and the Development of Internet Art” is a project that emerged out of my research on early internet-based art practices. In conversing with artists who were working in the 1980s and 1990s, I heard one theme repeated over and over. What made computer networks so exciting then is something that we now take for granted: their ability to facilitate communication and collaboration in ways that collapsed time and distance. Further research revealed that these interpersonal connections were not just important to net artists—they were the crucible out of which a recognizable internet-based art practice grew. Online, connections were forged first through dial-up message boards and then through web-based email lists; offline, the conversations and collaborations that were initiated on the lists were carried into peer-supported media centers, arts festivals, and intimate social gatherings. I undertook the data visualizations that make up the core of this project in order to begin to organize this history and to better understand how participation in these networks helped to structure and define early internet art. The essay establishes the historical field and provides essential context for understanding the visualizations; the map and timeline allow you to zoom in on the individual lists, centers, and events, or zoom out to look for temporal or geographical patterns. The timeline tracks the interplay between on- and offline networks over time, including the shift from early technologies like the BBSes toward web-based applications like the Listservs, which is tied temporally to a significant rise in general internet use as well as the number of people making internet art. The map highlights the different factors that contributed to the persistence of locational specificity in spite of claims for the internet’s globalizing effects; as you can immediately see, the popular notion that Europe dominated 1990s internet art is supported by the map, as is the relative importance of regions in the United States that also dominated other areas of contemporary art (New York, California). The simplest way to use the timeline is to click on the arrows on either side of the current slide to move forward and back one slide at a time; this preserves the limited narrative progression in the descriptions. You can also hover your mouse over the gray timeline beneath the slides to scroll horizontally and click on any individual item. Note that the timeline contains information on all of the key elements of the essay—BBSes, web-based lists, media arts centers/labs, and meet-ups—whereas the map excludes the web-based lists because the concept of local geography becomes meaningless in that context (the geography of the users was typically international, the geography of the creators could easily be spread across multiple locales, etc.). To use the map, click on any individual point to view an information pop-up; the BBSes are represented by black points, the media centers are purple points, and the meet-ups are blue points. A navigation bar at the top left of the map allows you to zoom in or out on any area or click on the home icon to be returned to the full map view. And there are useful navigation tools at the top of the pop-ups allowing you to skip to the next item in this area, expand the pop-up, or close the pop-up. You may need to zoom out and click and hold the map to move the view in order to see points in South America, Asia, and Australia. As you use the visualizations, it’s important to keep a few points in mind. First, like any history, the collection is inherently incomplete. If you know of a group, art center, or event that’s missing, please contact me so that I can add it. Second, the general timeline ends with things that occurred around 2003 because that is a significant transition moment in internet-based art, but there is some ambiguity in the ending dates of individual items. In many cases it was difficult to pin down an exact ending date; these points of uncertainty are noted with question marks. There is also some ambiguity in the geography; for the most part, the points are only accurate to the level of the city or town, not to a specific address. And finally, there is a glaringly obvious geographical gap: there are only a few points located anywhere outside of Europe or North America. (Moving the map will show a small number of points in South America, Asia, and Australia.) As I note in the essay, this is partly due to the fact that the groups, centers, and events that were most active in the formation of these interpersonal networks were located in Europe and North America, which, in turn, influenced the dominance of European and North American internet artists during these years. However, it’s important to be aware of the fact that there were people making internet art in other regions during the 1990s, some of whom—like the Indian Raqs Media Collective and the South Korean Young Hae Chang Heavy Industries—are still influential today. 1 Of course, financial, technical, and infrastructural limitations meant that the effects of local context persisted in spite of claims that the world was entering a new era of digital globalization, and these effects often reinforced existing political and economic imbalances. For an important critique of the utopian claims surrounding the internet and globalization, see Jonathan Crary, “Critical Reflections,” Artforum International 32, no. 6 (February 1994): 58. 2 Larry Press has scanned maps from the ARPANET Completion Report that track the growth of the ARPANET networks between 1969 and 1977; they’re available at http://som.csudh.edu/cis/lpress/history/arpamaps. 3 The project returned later in the 1970s with the goal of having a broader range, and lasted through part of the 1980s, building a database of contributions. You can learn more about the early history of Community Memory at Joyce Slaton, “Remembering Community Memory/The Berkeley Beginnings of Online Community,” SFGate, December 13, 2001, http://www.sfgate.com/news/article/Remembering-Community-Memory-The-Berkeley-2842143.php. One of the founders has also posted early documentation at Mark Szpakowski, “Community Memory,” The WELL, November 4, 2006, http://www.well.com/~szpak/cm/. 4 More information about the artists and this project can be found at http://www.ecafe.com. 5 Historians tend to lump all of these systems under the umbrella category “BBS” unless they want to highlight specific technological differences. For our purposes, it’s just important to be aware of the fact that there were multiple organizations from different parts of the world experimenting with building internet-based communication systems; most of these platforms were available for use internationally. 6 In fact, several BBSes were run, or heavily populated, by mail artists; in 2014, MOMA traced the connection between mail art and internet art through the exhibition Analog Network: Mail Art, 1960—1999. See http://www.moma.org/calendar/exhibitions/1482?locale=en. Florian Cramer has also written on this connection; see, for example: Chiara Moioli, “Neoism Now & Then. In Conversation with Florian Cramer,” Issuu, 2015, https://issuu.com/linkeditions/docs/cramer_prova/11. 7 In these early days, there were also many artists and museums who identified the web as a useful tool for things like finding new audiences and sharing existing work—the December 1995 issue of Art in America provides an excellent review of the many different ways that the art world had begun to explore the internet’s potential immediately after the appearance of the web. This essay, however, focuses on artists who were interested in the internet itself as a site of inquiry and practice, rather than primarily a platform for distributing other work. 8 Early internet infrastructure developed piecemeal because it was driven by local investment and organization, which meant that relatively wealthy regions like the U.S. and Europe had internet first, although networks had started to pop up in Australia and Asia by the 1980s. 9 In fact, many artists were specifically attracted to the social aspect of computer networks—as one recalled, the fact that most major curators and gallerists were still flummoxed by the internet meant that those who were going online joined an “in club” that felt welcoming, sociable, and very briefly insulated from the competitive influence of art markets and institutions (Hakim Bey’s texts on Temporary Autonomous Zones were widely circulated among this crowd). G.H. Hovagimyan, interview by Megan Driscoll, July 27, 2016. 10 Vuk Cosic, interview by Megan Driscoll, February 17, 2016. 11 Although email itself well predated the BBSes, Listserv, Majordomo, and similar web-based applications made it easy to mimic the group discussion function of a message board by allowing individuals to email messages to a large, centrally organized group. 12 For example, jodi is an internet art duo best known for projects that examine the underlying code structure of networked entities like email, websites, and mobile applications, and they would sometimes send out emails with entire artworks in the subject line, which 1990s email clients struggled to manage. There were also artists who were interested in experimenting with creating spam engines as a form of internet-based art, which you can see on Frederic Madre’s Palais Tokyo mailing list. 13 One particularly well-known example is the 1997 Homework project in which active members of several lists stumbled on artist and professor Natalie Bookchin’s online syllabus for a course on internet art, distributed the final assignment via the lists, and asked her to grade the results; the cumulative final work demonstrates how integral the lists and discussion groups were to the development of models like collaborative authorship that have come to define early internet art. For more information, visit http://bookchin.net/projects/homework. 14 MySpace, the first widely used social media platform, appeared in 2003; the term “web 2.0” started to become popular around the same time. For an authoritative attempt at defining this rather slippery concept, see http://www.oreilly.com/pub/a/web2/archive/what-is-web-20.html.